Oatmeal was one of my favorite breakfasts though I had not had it in a long time. I ate the instant oatmeal for breakfast pretty much every day throughout university but eventually I had had enough. 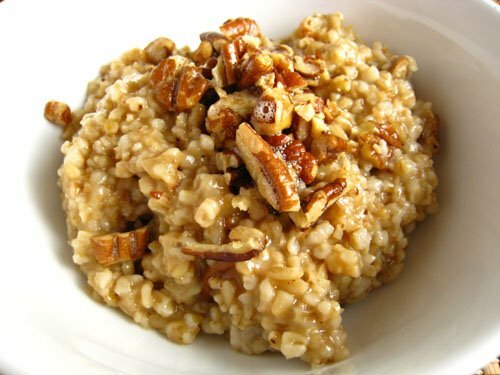 I was taking a really long break from oatmeal until I came across this post about steel cut oatmeal. One of the reasons that I had continued to not eat oatmeal after university was that I knew that the instant oatmeals were not all that healthy. The steel cut oats with almost no processing promised to be pretty healthy so I had no excuse not to try them. 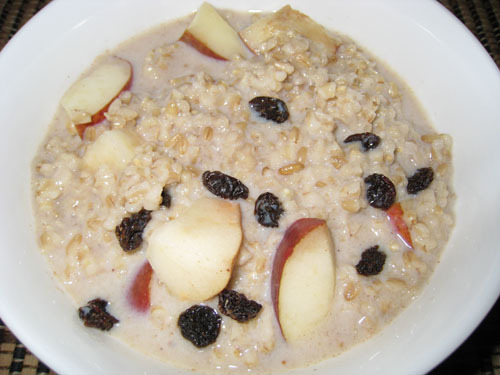 I am glad that I did try the steel cut oatmeal as I enjoyed it and I have been eating fairly often since. The first time that I cooked the steel cut oatmeal I followed the directions on the box. 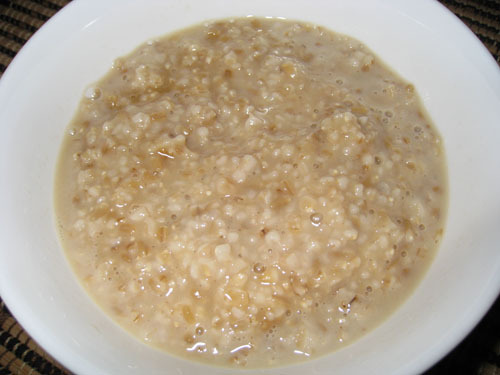 Simmer 1 cup of the steel cut oats in 4 cups of water for 30 minutes. The oatmeal came out perfectly. It was thicker that the instant oatmeal. I would describe it as “al dente”. It had a bit of bite and you could chew it. I really enjoyed the texture of the steel cut oatmeal. There was enough for 4 serving in the batch so I placed the other 3 servings into plastic containers and tossed them in the fridge. The next morning the oatmeal was almost solid when it came out of the fridge. I added a tablespoon of milk and put it in the microwave for a minute. I stirred the oatmeal and added another tablespoon of milk and put it back in the microwave for another minute. I stirred it and added another table spoon of milk and it was perfect. So if you cook a big batch of oatmeal one night it is super quick to reheat for breakfast. I have a rice cooker with a timer and a porridge setting so I though I would try cooking the oatmeal in it. I placed 1/4 cup of the steel cut oats and 1 cup of warm water in the rice cooker and set it to porridge mode and set the timer the night before. When I woke up I could smell the oatmeal cooking and by the time I was ready for breakfast it was done cooking. I have to say that the rice cooker cooked the steel cut oatmeal perfectly. Despite the fact that the steel cut oatmeal requires 30 minutes to cook there are two convenient ways to have it for breakfast even on a weekday. Update: I tried toasting the steel cut oatmeal before cooking it and it turned out pretty good. When the oatmeal was cooking its nice aroma was stronger and nuttier. When it was done cooking it had a really nice flavour. I think that I will be toasting my steel cut oatmeal from now on. This was the first oatmeal that I tried as it was my favorite flavour in the instant oatmeals. This was my favorite one so far. 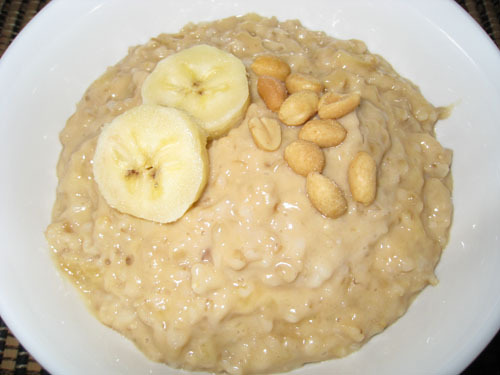 The peanut butter and mashed bananas made this oatmeal was nice and creamy. The peanuts on top added a nice contrast in texture. I enjoy eating strawberries dipped in sour cream and brown sugar and I though I would try adding those flavours to oatmeal. Apple crisp is one of my favorite desserts and I thought that I would try making an oatmeal out of it. 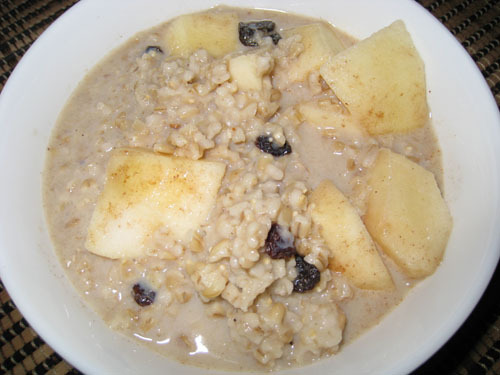 For this oatmeal I used the microwave cooking method so that the apples would get cooked in the microwave for two minutes and become just slightly tender but still firm. Once I had tried apple crisp oatmeal, pear crisp was not far behind. 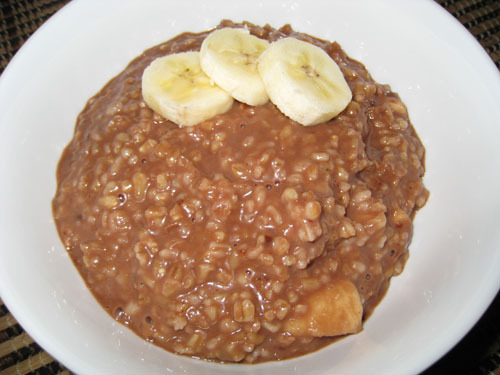 When I saw this post about chocolate and peanut butter butter oatmeal I knew that I would have to try it. I decided to use nuttela as my source of chocolate. It turned out to be really good! It was nice and creamy and chocolaty and peanut buttery. Such a great combination of flavours. 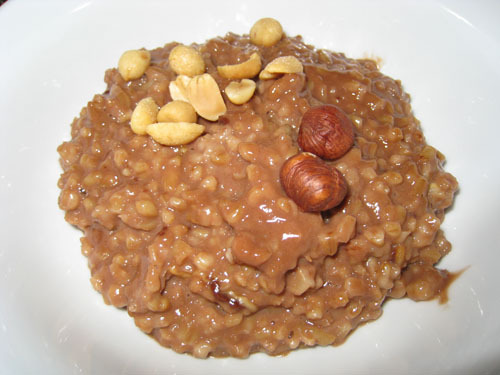 Having tried and enjoyed the chocolate and peanut butter oatmeal I though that I would try turning my favorite way to use nuttela into oatmeal. I like a nice and simple nuttela and banana sandwich. Nutella and bananas go really well together and the chocolate and banana oatmeal did not disappoint. 2. Add the pecans and toast until the butter browns. 3. Mix everything into the oatmeal. 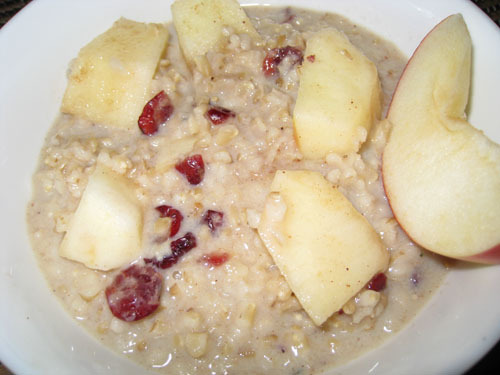 For me, oatmeal is great comfort food, especially on cold winter days. Take a look at the Comfort Food Cook Off at The Garden of Eating. 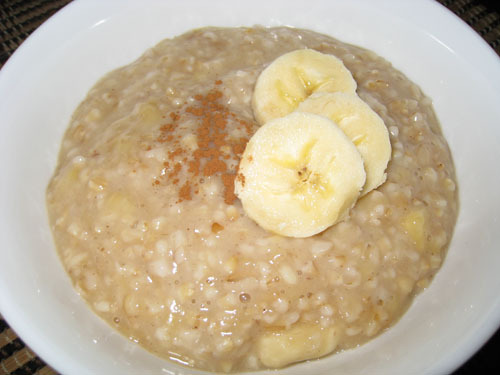 I love steel cut oats and I follow a recipe developed by Cook’s Illustrated. It calls for toasting the oats to bring out the nuttiness. The cooking liquid is 1 part milk and three parts water. It makes it that much more creamy. I do like oatmeal in savory dishes too. 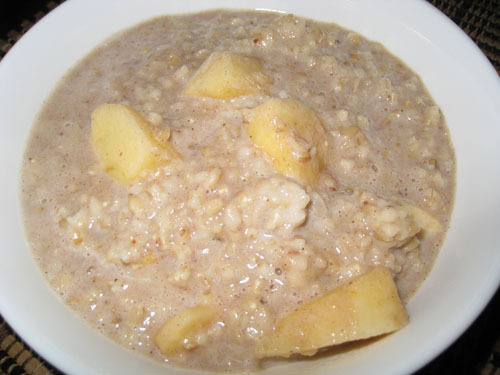 I have blogged about my breakfast this morning using steel cut oatmeal. Every one of those look great! Though I don’t think I could eat sour cream on my porridge. How about some raspberries??? I confess I am of the powdered add water ilk…and my best added ingredient was a scoop of ice-cream…not too exciting but delicious! What beautiful variations on a familiar theme! I am really intrigued by the peanut butter banana one. I think I am going with the honey,banana & walnut oatmeal Kevin. 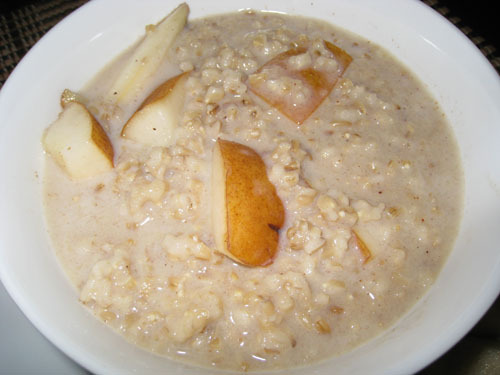 When I was growing up we had oatmeal almost every morning for breakfast. Sadly I don’t have it nearly enough these days. So many selections. That’s great! I’m usually not very adventurous with my oatmeal (raisins, brown sugar and milk) but this definitely gives me some options to pursue. Oat-meal! Oat-meal! Ra! Ra! Ra! I thought I was oatmeal’s biggest cheerleader, but it looks like maybe you are. I confess, I’m in a rut. Oh look! It’s dried cranberries, rice milk and ground flax seed. Again, for the 478th morning in a row. And steel cut oatmeal is heavenly. Do you happen to have the chain Trader Joe’s in Toronto? 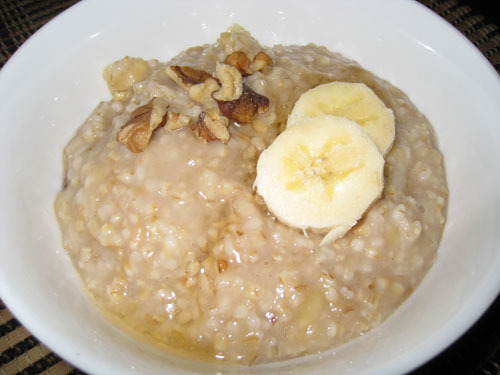 They make a frozen steel cut oatmeal that is fabulous for those rushed mornings. I highly recommend it! Kevin, you are the oatmeal King!!! Nice combo’s on all of them! I have to try the honey, banana, annd walnut one! You’re crazy! You must be sick of oatmeal, by now. Peanut butter & bananas is hands-down, my favorite. Although, the one with strawberries & sour cream intrigues me. I love strawberries and sour cream together. I made crepes with a sweet sour cream/strawberry filling, and they were great. What a wild collection of oatmeal recipes Kevin — worthy of your creative mind! I’ve always liked oatmeal, but once I tried steel cut, there was no going back to the “mush.” I’m really impressed by all these variations, Kevin. The strawberry and pear recipes look so good! How interesting, an post on the topic of oatmeal. I like the apple cinnamon one best! Reading about the oatmeal, didn’t really excite me and when I saw the plain one I though nah, not for me, but then I scrolled down! You are definitely King of Oatmeal! I am thinking I will try the banana & peanut butter and the apple crisp first. Yum! The peanut butter/banana looks soooo creamy! OMG an oatmeal bonanza! They all look amazing, but I am especially dying to try the pear crisp version…freaking YUM! I love oatmeal and eat it just about everday! (though I’ll admit I am lazy and use the plain instant kind). My favorite mix-in is 2 tbsp of pumpkin puree, with a dash of cinnamon and cloves, and sometimes dried cranberries too. Except when strawberries are in season – then, I love my oatmeal with strawberries! Wow, thanks for all the oatmeal ideas! I’ve never worked with steel cut oats. (I’ve actually only cooked instant oatmeal). I know! Gasp! I’ll have to take the time to make the real thing now. You know, I’m really not a big oatmeal fan, but I should try some of these and I just might be converted! Love this post…so many great varieties!! Thanks for the ideas:)! 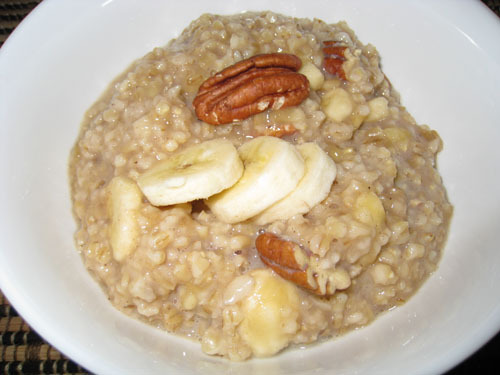 Wow – you have totally inspired me to try some new ways with my morning oatmeal! Great ideas! I’m so glad I found your blog! I think I’ll try the peanut butter & banana soon! Wow, what a great selection of oatmeal recipes to try! 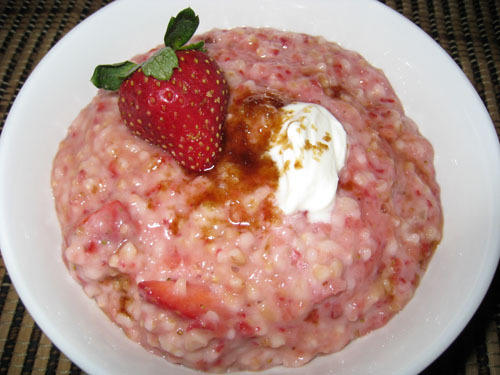 I really like the idea of “Strawberries with Sour Cream and Brown Sugar Oatmeal.” It sound wonderful. Aaah! wow u have an extensive list of stuff here! Every morning, my oatmeal is what i look forward to the most! There was a time I hated it, but now, I cant live without it! My secret recipe – quaker oats, some milk, microwaved for about a minute, take some smuckers wildberry jam, mix it with the oats and mmmmmmmm delishhhhh! am hungry now… and its 1 AM!!! 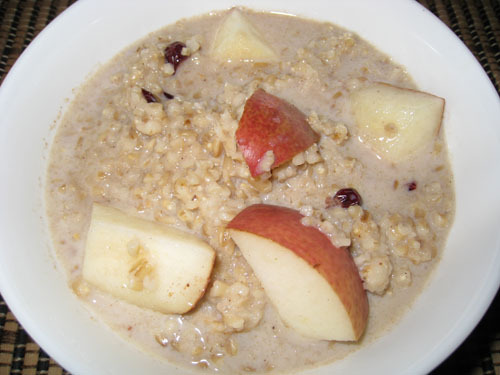 Wow–I love all your oatmeal ideas! I especially like that you posted a photo to go along with each recipe. Great site! I've added you to my favorites and look forward to exploring your blog in its entirety. this is cool! I have a very bare bones panasonic 6-cup rice cooker 9tiny) so I don't know if I could use its one button auto sense cooking method to cook steel cut oats overnight – what do you think? I don't want to do a massive amount of portions because I don't have room in my spare fridge… one or two servings max at a time. 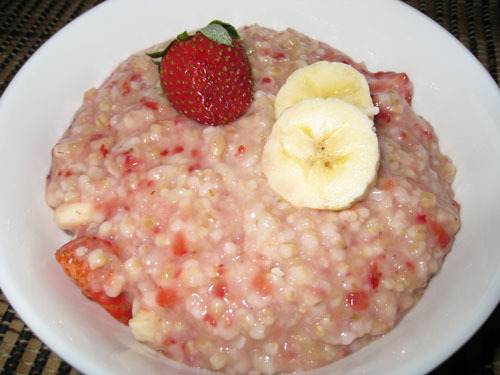 also I love the idea of strawberry oatmeal! However, I think I'd rather have strawberry oatmeal chilled or room temperature. 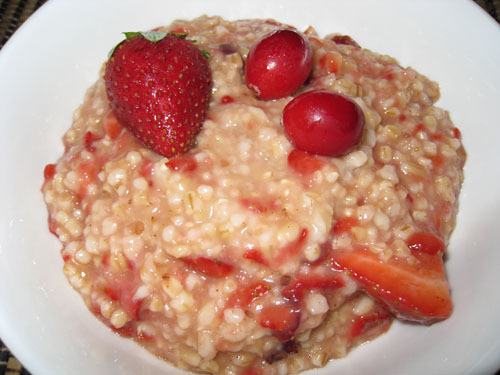 do you think mixing pureed strawberries and water/milk to precooked steel cut oatmeal without heating it would get it absorbed enough? Emma: You are going to need a rice cooker with a porridge setting to make oatmea in itl. I normally make it in single serving size which is perfect as I do not have a lot of spare space in my fridge either. I like the sound of a cool stawberry oatmeal but I find that oatmeal gets pretty solid in the fridge. This is not a problem when you are warming it up and adding a liquid like milk but I am not sure how well it would mix cold. It would be an ineresting experiment though! 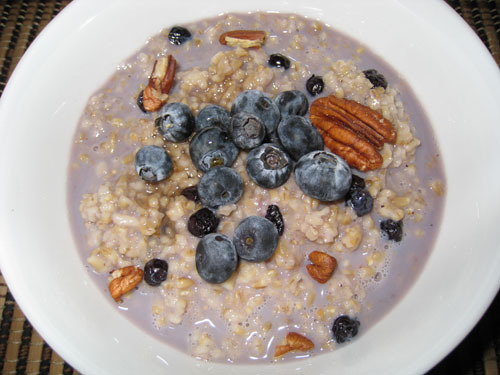 The Blueberry Oatmeal looks to die for! I am sour cream and plain oatmeal fanatic! I drizzle light agave nectar and yum! Sweet and sour:) I'm so impressed with your recipes! Moving on to steel cut oats! Thanks for the ideas! The Recipes look yummy! I wanna try the strawberry banana one but I'm not sure the process. When donuou add the bananas ans strawberries?? 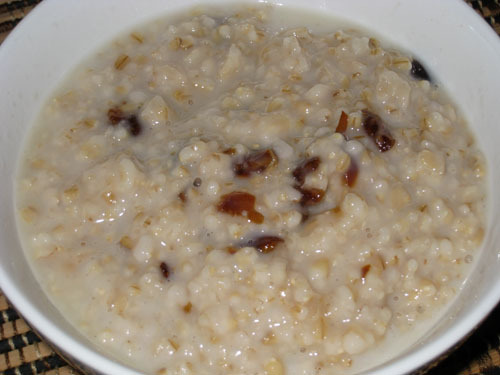 Malinda: Once the oatmeal is cooked, just mix the other ingredients in and remove from heat. I like to add different flavored applesauces to my oatmeal.